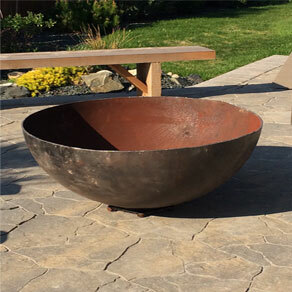 Each of our spherical fire bowls are crafted out of 1/4″ steel (up to 10x thicker than store bought firepits), diameter is 30″ and 12″ high, complete with a drain hole at the bottom for rainwater. New to the Winnipeg market and locally made. No thin metal, you’ll get several lifetimes of burning out of these heavy duty units. 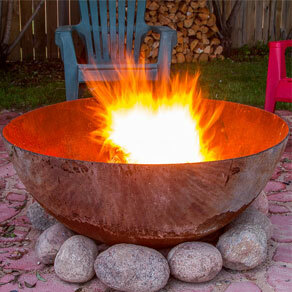 Firewood Manitoba has been supplying firewood for years and we wanted to find a long lasting, well designed and functional firepit, all while looking good enough to be an attractive feature in our yard. We couldn’t find one locally so we started making them ourselves. Our Fire Bowls look good with a fire burning but are just as visually pleasing sitting in your back yard or at the cabin when they don’t have flames dancing in them. You can use them as a planter, a serving table or a piece of art and then if you feel like a fire they can do that too. They are an architectural feature that can be admired from a distance as well as utilized to bring people together. Heavy enough (175 pounds) that they’ll last for generations but light enough that you can move them around as plans change or transport them to a party, the cottage, on holidays etc. Grills are also available if you feel like barbecuing. 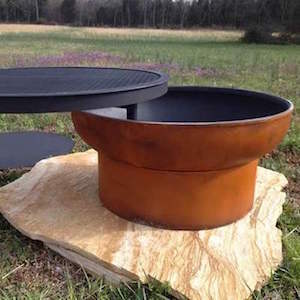 The bowl shape directs the heat up and out, perfect for barbecuing. See Additional Information for add-on’s and customization. Grills, tripods, spark screens, custom colors and custom lettering are all available as well. Please contact us for a quote. 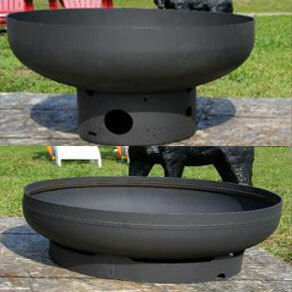 If you’re looking for a certain design we can customize your Fire Bowl to match your tastes. Delivery is INCLUDED if delivered in and around Winnipeg. Other delivery areas also available, but a Quote is required.